Bret started shooting at 5 years old and since that time has competed in various shooting sports, mainly IPSC and long range rifle. He was ranked as high as the #1 Master in the USA for USPSA Open class during 2008, shooting a high average of 94.91%. For 2011 he won the Idaho State IPSC Champtionship, in 2010 he won the Master Class at Area 1 in Idaho, and Master Class at the Golden Bullet Championship in California. He won the regional Area 1 Championship Overall title in 2005 for USPSA, representing 8 western states. 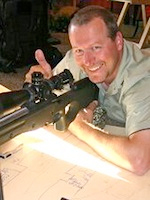 Competing in unknown distance long range rifle matches, he finished 4th out of 35 sniper teams in the grueling ITRC match for both 2007 and 2004. 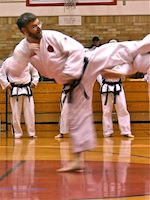 He competes and teaches competition techniques as time allows, which isn't much because Crosstac has grown into a huge passion. He works so hard, we have to slide food under the door of his office if we hear the growling getting loud. Steve is 4th Degree Black Belt in Taekwon Do. Yes, we're all well-rounded here at Crosstac. He also has 25 passionate years of product design and manufacturing under his other belt. In his heart, he knows he was made by God to design and build things. Currently, he's designing a revolutionary placer gold concentrator in his spare time, and if you're into tech, you'll be thrilled to know Steve is a wizard in SolidWorks and manufacturing in front of our CNC mill. Other projects he has going include building a second Romanian AK47 and straightening the barrel of an 1892 Winchester .32-20 that was given to him by his father. Steve's father used it to bag his first deer... Steve bagged his first deer with it... and he's hoping his son will carry on that tradition shortly. On the current Crosstac slate, he's working on several projects using pressure formed glass fiber resins to hopefully be incorporated into several new products.